Click on the tab menu to access apps organised by skill type. Most of the apps I've selected can be used in a range of learning areas but they are all relevant to second language learning. If you are using any good apps not listed on these pages please email me the details and I'll add them. This particularly applies to language specific apps. For details of apps that are relevant to Bloom's Taxonomy and Gardner's Multiple Intelligences go to my Learning technologies page. The Education Department of Victoria is conducting an iPad trial across all curriculum areas. This site contains practical advice and resources for using iPads for learning including classroom ideas, practitioner case studies, a list of reviewed education apps and key findings from the trial. iPadagogy is a YouTube site that contains an increasing number of "how to" videos outlining how to use some iPad apps. It's well worth subscribing to this site through your YouTube membership. iPadagogy covers many of the recent educational apps that provide real-time feedback on student performance and understanding. When asking a question in class and then waiting for a show of hands, there can be a tendency for peer pressure to sway what some students will say. This can skew the actual findings of understanding in the classroom but using an iPad can resolve this. Some apps allow each student to answer questions with no input or influence from other students. This can ensure that a teacher knows what each student is picking up on or what they are struggling with in the class. iPadagogy’s video reviews of these popular applications help educators to see the immediate usefulness of apps being reviewed. Check out these How to ... videos from my Pinterest board. Click on each image within the board to navigate to the video or document it links to. The board covers a broad range of iPad apps and online tools. The image below is a screen capture of my Pinterest board, which is a collection of additional website links related to iPad use. Alongside the Pinterest image is a capture from Richard Wells' iPad4schools blog. 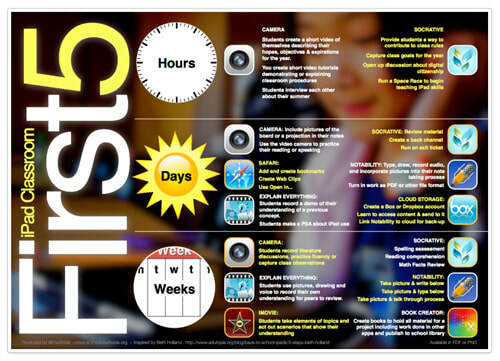 You may find this useful if you want to focus on the absolute basics as you start to use iPads with your classes. If you want more inspiration about individual apps you could also check out Richard Byrne's Pinterest board. For even more apps go to Joyce Tabone's blog. ​If you need help connecting a single iPad to a data projector so that you can demonstrate items wirelessly, this link by Tony Vincent should be useful.